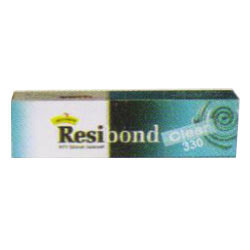 Resibond 330: Resibond 330 is a high performance non corrosive Resibond Wood Sealant suitable for making gaskets over flanges. It replaces paper gasket and prevents leakage of oil even at 200 degree C. The Skining time of Resibond 330 is 5 min. and touch drying time is one hour. Packing: 5ml, 10ml, 20ml, 25ml, 50ml, 85ml, 100ml.